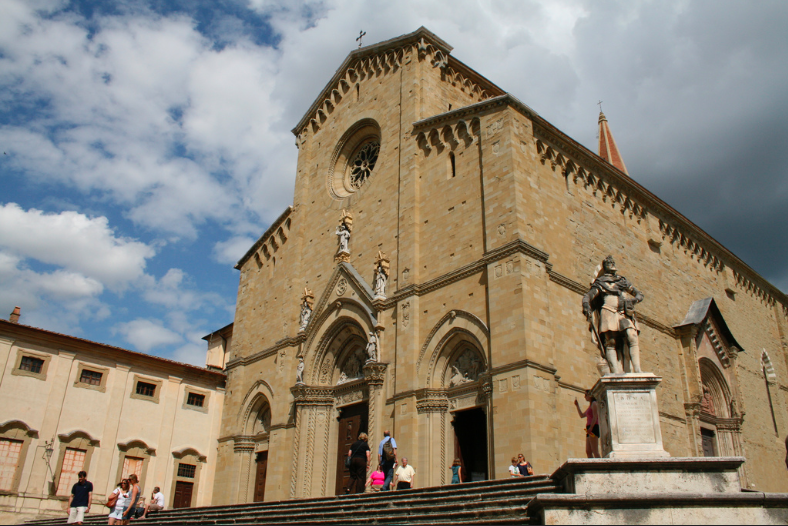 Imposing Gothic building, begun in the late thirteenth century and lasted with various interruptions until the beginning of the sixteenth century, the cathedral dominates with its mass the hilltop of Arezzo. The facade, left unfinished, was built at the beginning of the twentieth century and the lateral portal is fourteenth in Roman-Gothic style. The bell tower was built between the nineteenth and twentieth Century. The interior is divided into three naves by tall pillars, which together with the pointed arches give the whole a strong vertical momentum. Between the numerous works there are many worth to be remembered, like the windows, work of the French artist Guglielmo de Marcillat (XVI sec. ), the tomb in the Gothic style of Pope Gregory X (XIV c.), above the altar the Ark of S. Donato (XIV sec.) , the city’s patron, the precious fresco by Piero della Francesca depicting the Maddalena (1465?) and the immense cenotaph of the bishop Guido Tarlati (1330) . Not to miss is the large chapel of the Madonna of Consolation, the work of the last eighteenth century, in which are hosted numerous works including some tarracotte from Robbiano.